Special Alert: Mount Sunapee State Park Public Information Session – Wednesday, September 26 (6 pm) at Mount Sunapee State Park (Sunapee Lodge), Route 103, Newbury, N.H.
New Hampshire DNCR Commissioner Sarah Stewart (Department of Natural and Cultural Resources) will announce her decision on the Mount Sunapee ski area lease assignment to Vail Resorts at a public meeting on Wed., Sept. 26, 2018. We encourage the public to attend this important meeting. There will be an opportunity for public comment and questions. DNCR will post the decision and related documents on its website after announcing its decision on September 26. In June 2018, Vail Resorts announced that it was seeking to acquire the ski area lease and operations at Mount Sunapee. The September 26 meeting will be the second information session in two months on the Triple Peaks sale to Vail Resorts. 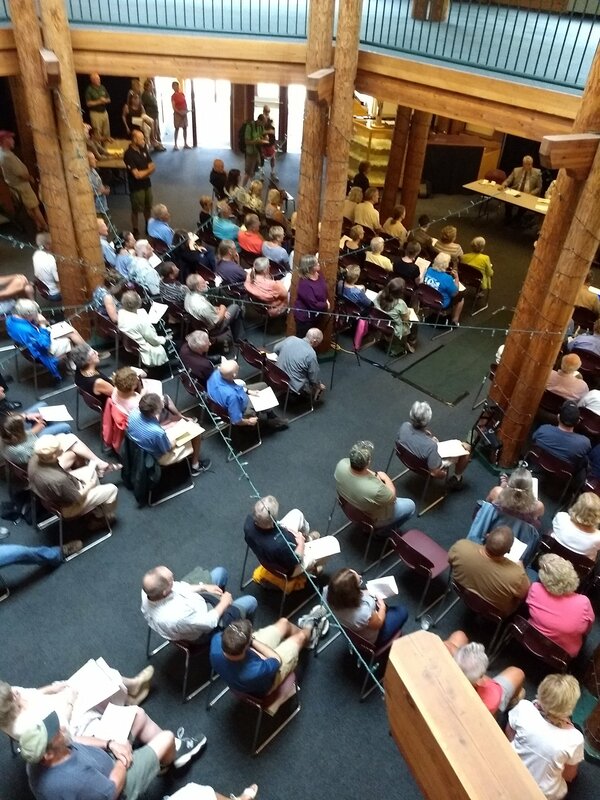 On July 25, Commissioner Stewart and N.H. Attorney General Gordon MacDonald hosted a session that included remarks by Tim and Diane Mueller (current operator/Triple Peaks), a presentation by Vail representatives, and public comment. View the July 2018 Mount Sunapee State Park information session via Newport Community TV. FOMS advocates for diligent and transparent management of the state-owned ski area. We seek public policy and process decisions that restore public trust and honor the original intent of leasing a significant portion of our iconic state park to a private operator. “New Hampshire citizens look to the State to exercise vigorous oversight and defend the public trust, no matter the operator or leaseholder at Mount Sunapee State Park. We also look to lessees at the park for leadership and operational and development plans that reflect local concerns and interests and respect our state park’s public values and the RSAs that protect our parks and natural heritage.” – Friends of Mount Sunapee, at the July 25 Mount Sunapee State Park Information Session. Permanent protection of Mount Sunapee’s western slopes from resort development, land conservation that respects the original leasehold area. Compliance with signage and advertising requirements to indicate state (public) ownership of the ski area at Mount Sunapee State Park. See FOMS comments, August 6, 2018. See Vail’s June 4, 2018, announcement. The upcoming public info session will help give insight into the potential changes coming to the ski area and Mount Sunapee State Park and possible future impacts to our local communities and region.